Have you ever had a no spend day or week? I tried a no spending weekend once a long time ago, but I failed. I’m good for the week, because I really don’t like to go out during the week. It’s the weekend that I’m weak. Put me in a Target, and all budgeting goes out the the window. I’ve been wanting to try it again-and really do it this time. But, I want to take it further and do a MONTH challenge. I think The month of September is a perfect time because I’m going on a girls trip in October, and with the holidays coming after that, it will be impossible. I’m really up for this challenge-are you? I think that with my goal to pay off all credit card debt by April, adding this challenge will help me get closer to my goal. If you are thinking about changing the way you spend, this challenge can be quite healthy for your finances. Even if you do it for a couple of weeks every month, it can help you keep on track with your monthly budget. I’m doing a month, but if you don’t want to do it that long at first, then I would start with a small goal. You will be more successful if you don’t bite off more than you can chew! In order for your no spend period to be successful, you must be prepared. Of course, you will still need to pay bills, but plan ahead of time what you will need (out of necessity), and make sure you stock up on it. I find that I overspend on groceries when I go every week (and sometimes, more days if I get a craving), so I plan on meal planning and buying just what I need for the month and that’s it. We will eat what’s in the house and not stray. The key is to eliminate any extra spending during this period, so figure out where you are tempted and eliminate that source. Instead of spending money during this time, spend your time making money instead! I do mystery shopping as one of my side hustles, so I plan on using my time at the store making money by accepting paying shopping jobs. Use this time to track what you chose not to spend. This will give you an idea how much those spending leaks are really costing you. Use that money to pay down debt instead, or add to your emergency fund, etc. This will be a trying time-I’m just being honest. But being creative can be the best part of this challenge. When you’re tempted to eat out, try to challenge yourself and cook a meal from scratch. Make it fun and have breakfast for dinner (I love this!) Involve the whole family to join in for ideas. Entertainment can be an area that can add up in costs. Check your local newspaper for free events, go to the park, make it a weekend you decide to clean out the garage or attic and donate unwanted stuff. Invite family over but make it a pot luck dinner to save on food costs. Most local libraries have DVDs members can borrow for free, so plan an evening in and pop some popcorn (if you already have it on hand) and enjoy the peace and quiet instead of noisy movie theaters. I will post my updates on my no spending challenge each week to let you know how it’s going. I hope you will join along and check back to see how it goes! Ok, are you ready? Let’s do this together! 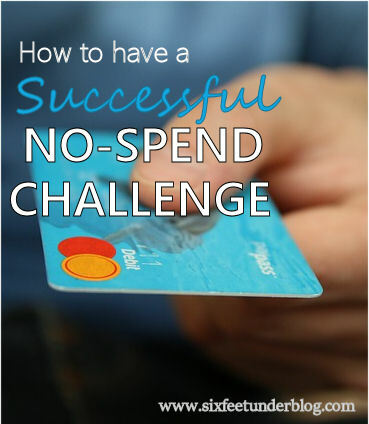 Leave a comment if you plan on doing a no spending challenge too!